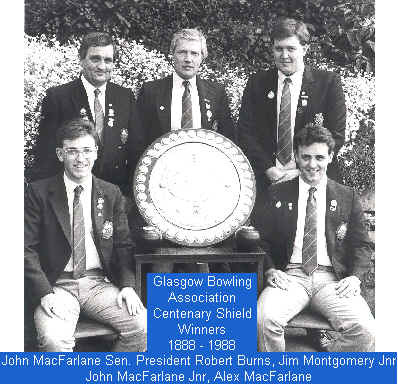 Cambuslang Bowling club embarked on charity work in 1992 after a tragic road accident involving one of our young members, Alex MacFarlane, who died on Boxing Day 1991 aged only 28. Harry Faulds at a Board of Directors meeting suggested that the Club should have a Charity Fund raising day in memory of Alex. With the blessing of the MacFarlane family and the endeavors of a young member Jim Montgomery Jnr, a close family friend, the Directors and members of Cambuslang Bowling Club under the presidency of Jim Montgomery Sen held the first"Alex MacFarlane Memorial Charity Day" on May 1992. In March 2006 the British Heart Foundation Glasgow Cardiovascular Research Centre in Glasgow University opened a Clinical Investigation Unit in Alex MacFarlane's memory. The club's charity day itself is one of sadness but also joy as everybody participating knows what it means to the family, the Club and most of all the charity. The support we receive from Bowling Clubs within and outwith the area cannot go unmentioned. Every year we have 96 bowlers and their friends supporting this charity event and making the day the great success that it is. The MacFarlane family kindly donated a "quaich" which is played for each year and presented to the winning rink. The day is hectic with preparations starting around 7.30 am. then Past President Harry Faulds the "master of ceremonies" kicks off proceedings at 10 o'clock informing everyone which charity will benefit from the days fundraising. Glenda and Jim Montgomery then swing into action cajoling everyone for their £'s as the tombola board swirls and swirls all day. At the days end the trophy is presented to the winning team followed by the presentation of the cheque to a representative from the nominated charity. Currently the organising & work for this charity day is co-ordinated by family friend, Glenda Montgomery and Alan Johnston a Cambuslang director and family friend. Like your Charity to be a beneficiary? Then please write to our Secretary at the club or e-mail the webmaister. Board of Directors consider all applications.